Call us today for all of your self storage needs. Call us today for all of your self storage needs! SPACE AVAILABLE NOW FOR RVs, CAMPER, and TRAILERS! 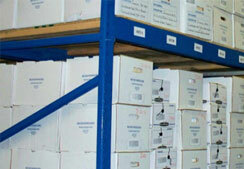 Undercover Self Storage is a family owned and operated company, established in 2003. We do whatever it takes to be certain that our customer is nothing but satisfied by offering the ultimate storage experience. We devote our time and energy to keeping your goods safe and secure while they are at our facility. Our state of the art facility features computerized gated access, motion-recording cameras and individually alarmed units. All of our units are car/truck accessible, so your goods can go directly from the back of your car to your unit without having to carry them up any stairs. We have indoor units from as small as 10' x 5' to as large as 10' x 40' and paved outside storage perfect for RV’s, boats, company vehicles, or just plain extra parking. Heated storage is available as well. Call (734) 354-9855 for details on our current specials! Wonder what fits in our units? Check out our Unit Size Guide! 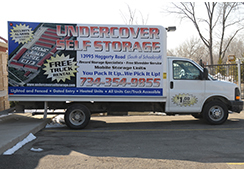 Undercover Self Storage, where quality, convenience and security come together. 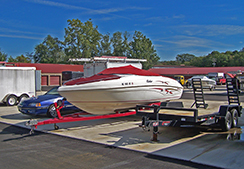 Outdoor Storage and Parking for Boats, RVs, Campers, and More! Isn't it time to gain back your valuable space? Now you can, easily and efficiently! 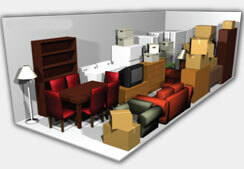 Use our box truck for FREE to move in to your new unit!